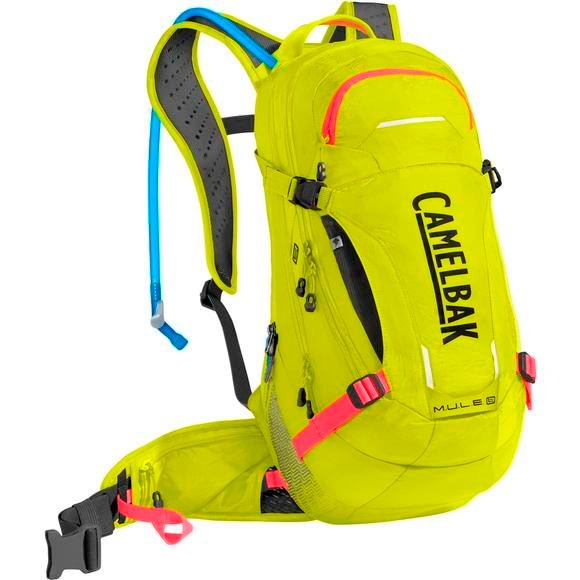 Camelback's iconic and versatile MTB pack is now designed to give you the Low Rider advantage. The M.U.L.E. LR combines the storage and features of the beloved M.U.L.E. pack with a lumbar design that offers more stability during aggressive downhill rides. Camelback&apos;s iconic and versatile MTB pack is now designed to give you the Low Rider advantage. The M.U.L.E. LR combines the storage and features of the beloved M.U.L.E. pack with a lumbar design that offers more stability during aggressive downhill rides. Instead of concentrating pack weight on your shoulders, this pack shifts your load to your hips for a lower center of gravity and more freedom of movement. The pack is built around a brand new 3-liter Crux reservoir that delivers more water per sip, with a design that&apos;s optimized for fast and fumble-free refills. Includes a Crux lumbar reservoir, which positions water weight low on your back for more stability and better balance on the trail. Includes a magnetic tube trap that lets you stow your drinking tube in place with one click, so you can drink without taking you eyes off the trail. Measurements 47 cm x 26 cm x 25 cm / 18.5" x 10.2" x 9.8"